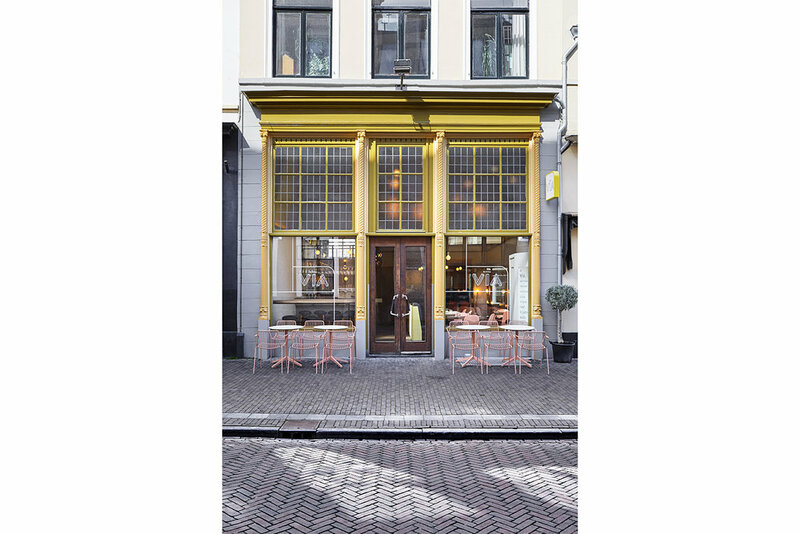 DA PORTARE VIA is well-known for baking superb wood-oven pizza’s in Amsterdam, Utrecht and recently in Zwolle. After years of baking pizza and growing their company from a small location on the Leliegracht in Amsterdam to 6 places, VIA - as they like to be called- decided to freshen up their identity. PUP creative agency was assigned to design a new logo, as well as a fresh house style, while Studio Modijefsky was asked to design an original interior for this brand new VIA. The assignment was to design a new spatial identity. Studio Modijefsky started with working on a strong design language that can evolve with every new location, creating a family for the new VIA restaurants. The design principles, consisting of a material library, principle shapes and custom designed elements are adjustable to the spatial quality of each individual site. Working on a library of wall finishes, floor principles, a series of light fixtures and a nice pallet of materials and colors, the interior design started to grow. An Italian touch has been added to the space by using different types of marble, mirror panels and walnut wood in the interior. Analyzing the logo, a diamond shape was derived from it, which is used as a whole or half (a triangle) to create playful accents in the space, combine materials and integrate signage. This can be seen on the benches, in the floor and on the bar. VIA is all about connecting; connecting people, talents, flavors, suppliers of great products and more. In the interior a range of connectors have been designed; elements that would suggest a similar connecting vibe. The aperitif table in front of the bar is one of these elements; it invites people to gather around and enjoy a drink before taking a seat, a connecting point to meet and discover new flavors and tastes; a perfectly mixed Negroni, the best aperitif before having a pizza. 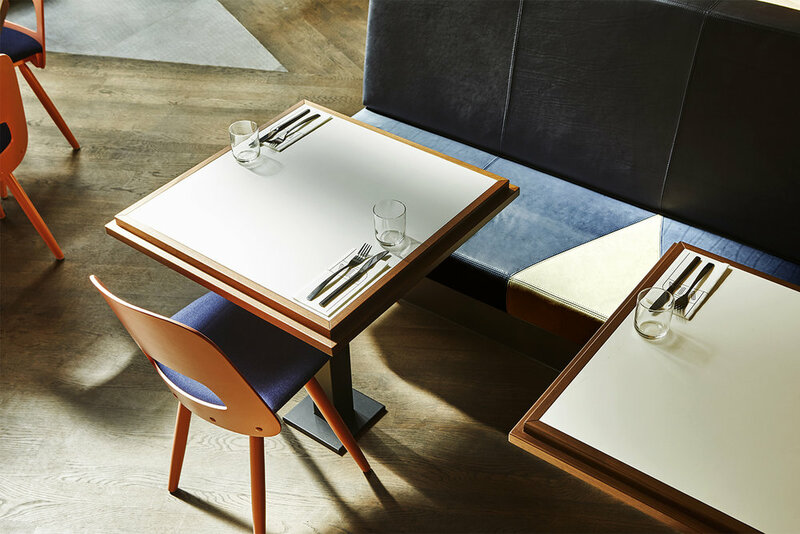 Custom made benches also act as connectors; with their exceptional design they stand out in the interior and invite people to share a seat and enjoy a nice dinner. The tables standing in front of these benches are specially designed to fit a literal connector; an extra table top can be fitted inbetween 2 table tops to transform 2 tables for 2 into a table for 6; to serve a family or group of friends. Little specials such as a table with a light under it or the chefs table in front of the kitchen are other connectors in the space. The first site completed with the new VIA identity is located in Zwolle. Set in the historic city center, this VIA sits in one of the oldest buildings in town, which has much to offer; a beautiful facade, an extremely high ceiling and plenty of light. The spatial identity created for the new space, fits the interior of this historical building, using classic materials with a new look and in a fresh setting. Using the full height the space had to offer, special frames have been designed to decorate the walls. These frames house the pizza menu, bar menu and VIA logo and identity. With indirect light, a bright yellow color and tilting forward these frames define the space on a different level. Lighting plays a leading role in the design of the interior. A steel structure of coloured profiles hangs from the ceiling. Connected with wires to a steel strip on the wall, these supply light for the adjacent tables. From the structure, several wires with light bulbs drop down, they form different figures and fill the space with illuminating spheres. 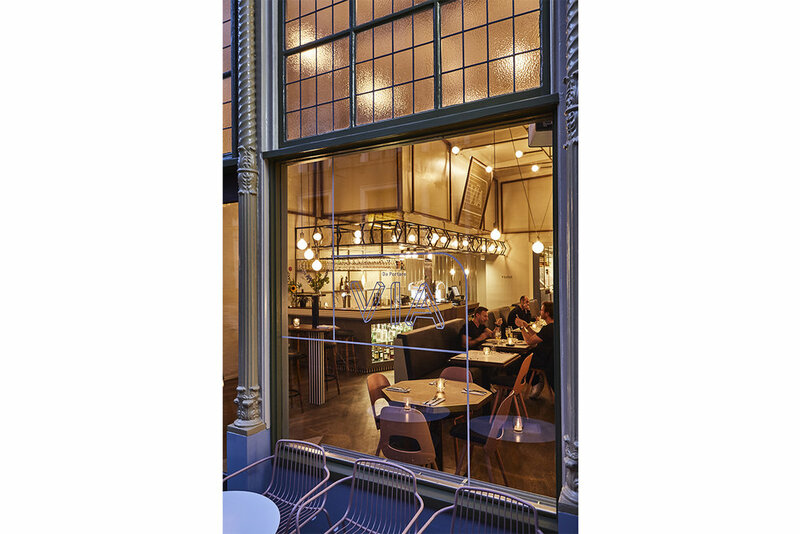 A steel structure hangs above the bar, highlighting its presence. The steel profiles form triangles, which are reflected in a mirror on the wall creating diamond shapes. Sitting under a crown of light, the bar is covered in subtle grey marble slabs, placed in an angle with faceted edges. An integrated vitrine in the corner; displays a fine selection of spirits and gives the bar a fine Italian touch. 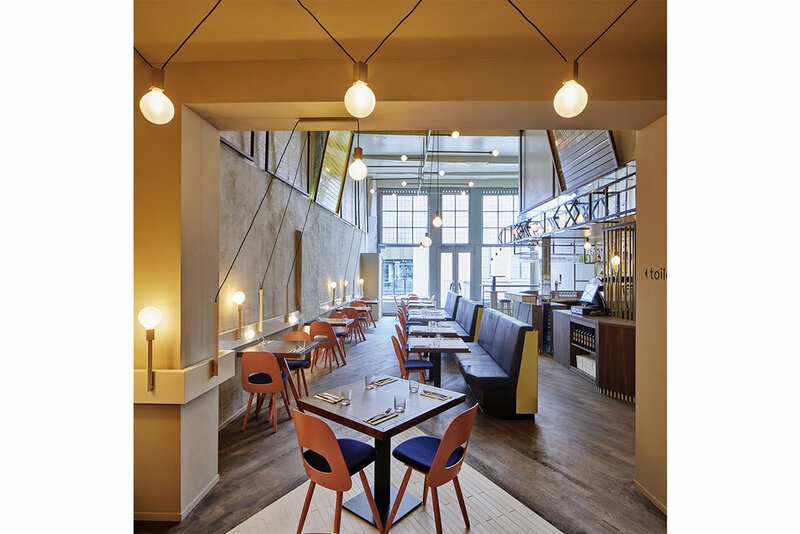 The interior is a subtle wink to the classic Italian essence; whether its black and white tiles covering the feet of the bar, the service point and aperitif table, the fence with light bulbs in it or the diamond shaped light box in the back bar. 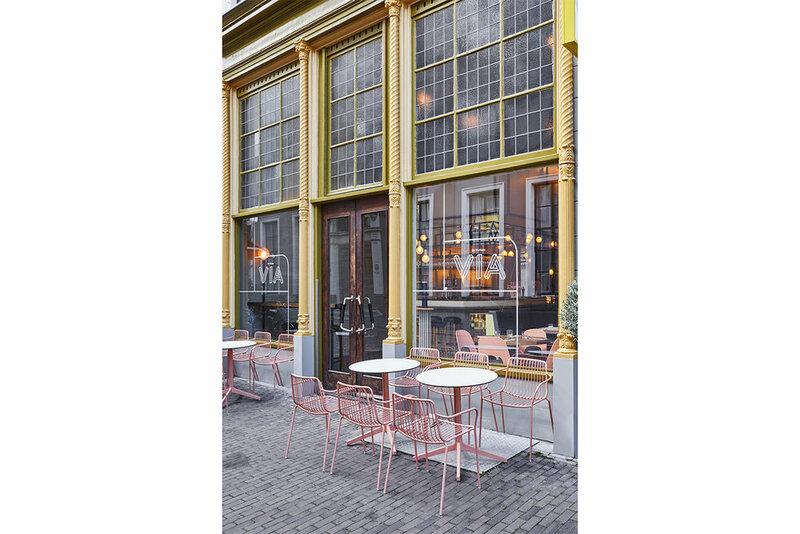 The newest member of the VIA family, after Zwolle, will open its doors in Utrecht, Studio Modijefsky is busy applying the VIA design principles to perfectly fit into the new interior. Arrivederci at the next VIA!